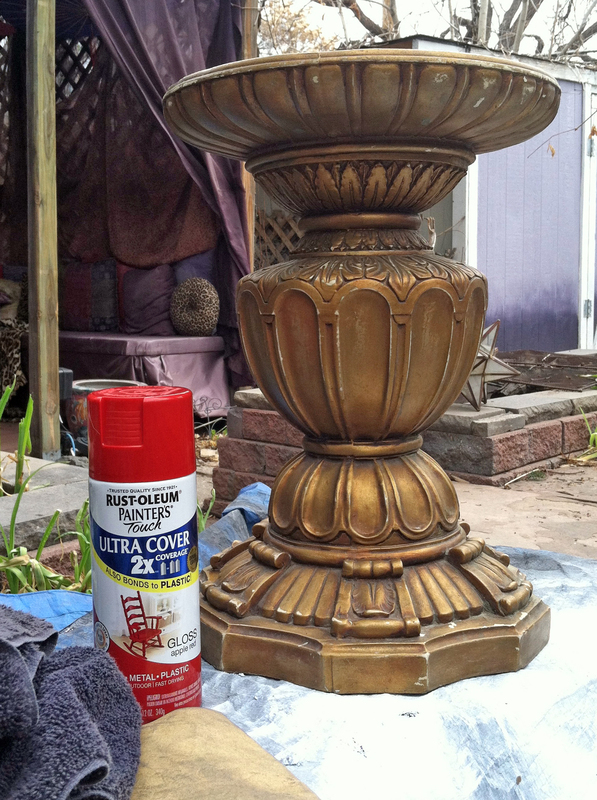 Paint…Hands-down the easiest and cheapest way to completely transform just about anything. 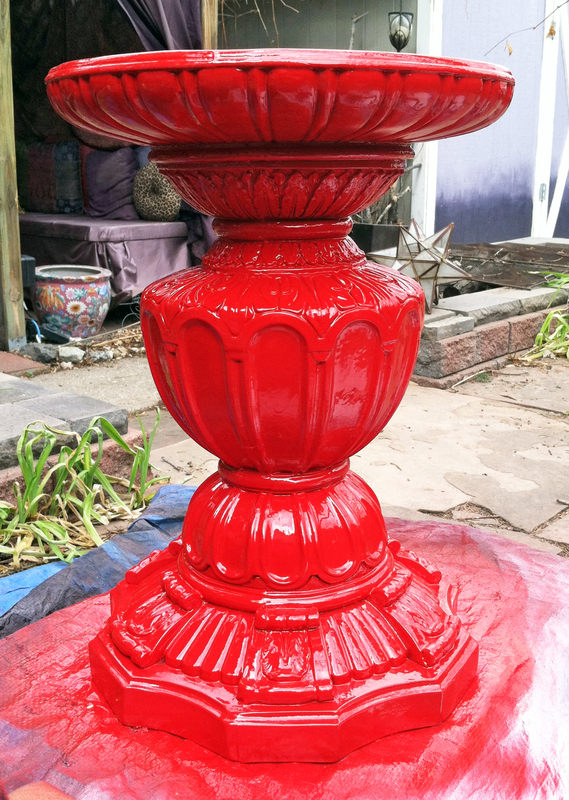 I painted two old things I’ve had around the house for years, and gave them new life with a can of glossy spray paint. They look great in the new Chic Rock Star Glam bedroom. 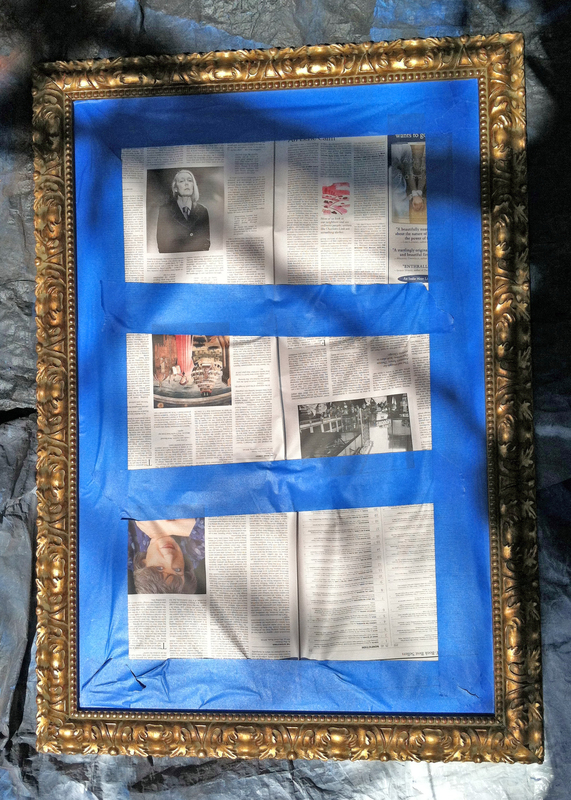 First, the Mirror. I picked up this big gold-framed mirror at a yard sale years ago. (If I remember correctly it was about $12) It’s a lovely mirror, but the gold frame made it look dated. 2 fresh coats of black gloss spray paint (about $5) and it’s a perfect fit for the new bedroom redo. 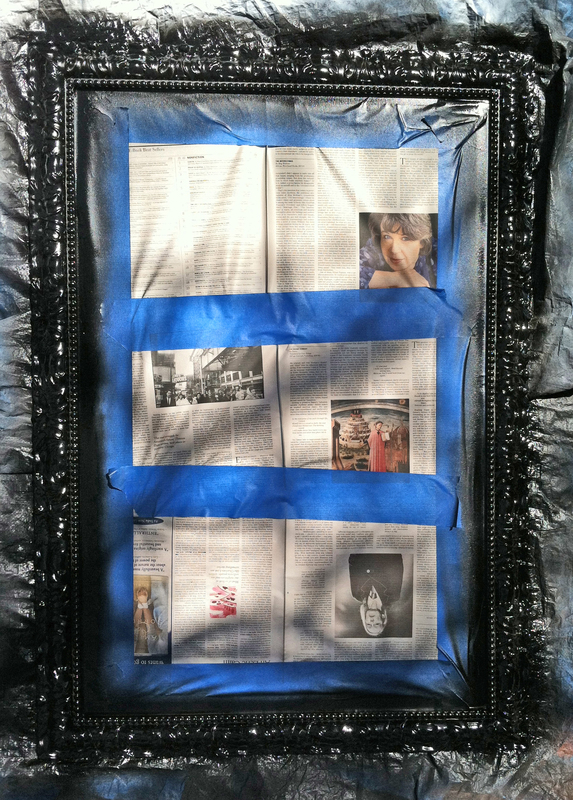 Mirror Before…all covered and taped and ready to paint. 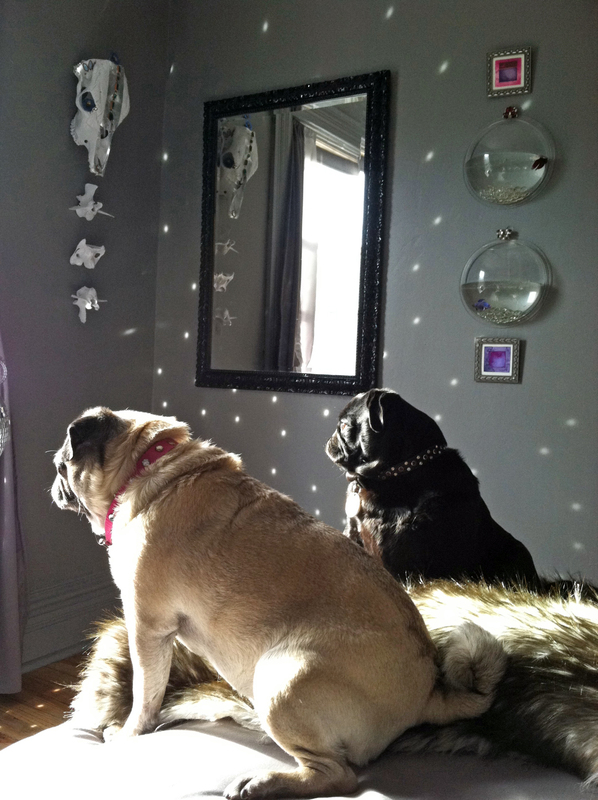 …and here it is, hung in the new bedroom with pugs Emma & Max enjoying the afternoon sun. Extra Note: The two Beta Fish hanging to the right of the mirror (named “Red Fish”, “Blue Fish”) came from Petsmart. The clear hanging bowls were found at Goodwill, months apart. I think I paid about $5 each. One of them was new in it’s box, all taped up by the thrift store staff. I got home, opened the box, and inside was a new jar of Beta food and a valid $10 gift card to Petsmart! That was a good day 😉 The two little watercolor paintings hanging with the fish are by artist David Castle. The sparkles on the wall are being cast by a static Hanging Disco Ball, and the Painted Cow Skull art project is HERE. The Faux Fur Blanket Project is coming soon, along with a few more Chic Rock Star Glam Bedroom projects…the bedroom is almost done! 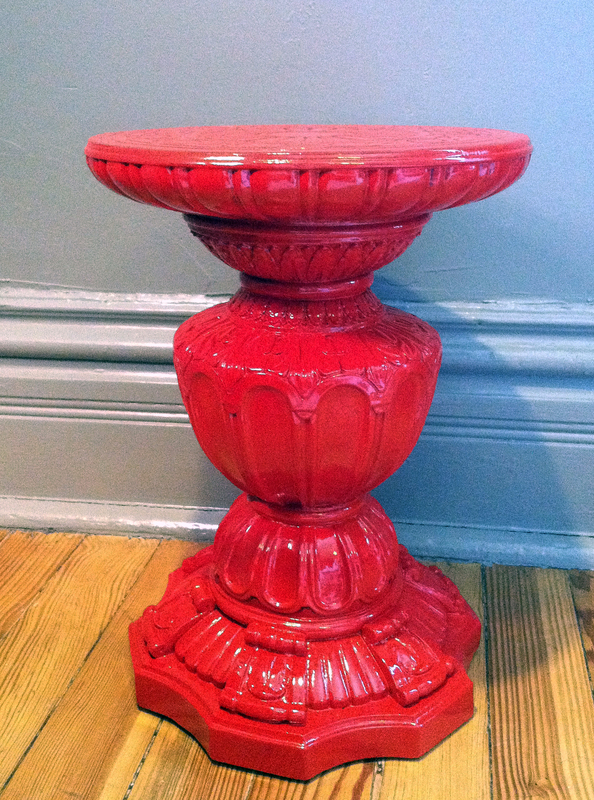 This resin cast stool was another yard sale find. ($10) It’s heavy and sturdy and a fun design, but the gold had to go. I wanted to add some bright pops of color to the room, so I decided to paint it a glossy Candy Apple Red. (3 coats) It looks great in the room. Stool Before, cleaned, sanded and ready to paint. Stool all shiny and red, in the new bedroom. I love the trans-formative power of paint! In the next 2 weeks I’ll be tackling a big dresser…what have YOU transformed with paint? Tell me in the comments section, I’d love to hear! This entry was posted in art, decorating, DIY, home, lifestyle, Thrift store shopping and tagged art, bargain hunting, bedroom, bedroom makeover, bedroom remodel, beta fish, budget, cow skull, David Castle, decor, decorating, DIY, faux fur blanket, fine living, garage sale, garden stool, Goodwill, lifestyle, Mirror, paint, painted mirror, painted stool, personal style, redecorating, redo, restyle, rock star bedroom, saving, shopping, skull art, style, thrift store, thrift store shopping, thrifting, yard sale. Bookmark the permalink.